Looking for the best mobile storage and moving company in Wall, NJ? Then look no farther than MI-BOX Storage Central Jersey. We are owned and operated locally. We value each customer and guarantee you'll be satisfied with the services we provide. We have cost effective solutions for all your moving and storage needs and best of all they're mobile. Mobile Storage and Moving Options are delivered right to your door for the ultimate convenience. MI-BOX mobile self storage and moving containers are secure, safe, and new. We have a state of the are Levelift and Delivery System which keeps your container and contents level throughout the delivery process. This greatly reduces the chance that your valuables will be damaged. Only MI-BOX Storage Central Jersey uses our patented technology to bring you the most advanced mobile storage and moving options. Mobile Storage Containers have become a generic term synonymous with moving and storage. 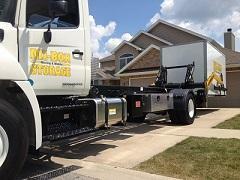 MI-BOX Mobile Storage & Moving is a U.S. company which has local dealerships throughout the United States and Canada. All MI-BOX brand storage boxes are built in the United States. MI-BOX of Central New Jersey services Wall, NJ and the surrounding communities. MI-BOX Mobile Storage servicing Wall and Central NJ is owned and operated by local people who want to earn your business and will do so by giving you great service and great prices on all you mobile storage and moving needs. We've opened in 2014 with all brand new equipment. We have three convenient mobile storage units sizes which to choose from. 8 ft. 16 ft. and 20 ft. Out storage containers can accommodate just about anything you need to move or store. MI-BOX brand mobile storage containers all have composite wall panels which will never hold moisture to ensure your contents are always protected from the elements. MI-BOX containers are all coated in hot dipped galvanizing to prevent rust. Rust that can form on the outside or underside of each container can stain or damage your driveway surface. MI-BOX also has a form fitted roof which won't allow blowing snow or light rain to penetrate the container and it keeps UV light from fading your belongings if the storage box is left outside for any length of time. MI-BOX Mobile Storage & Moving posts regular updates to our social media pages on Google+, Facebook and Youtube. Stay up to date with our latest moving and mobile storage specials in Wall, NJ by visiting one of our sites today. Need Self Storage in Wall, NJ? Then look to MI-BOX Self Storage of Central NJ for the most convenient and cost effective self storage solutions. MI-BOX self storage units are delivered to your door. There's no need to even leave your house, let alone renting trucks, paying for fuel charges or being kept to a strict schedule. Take your time and slow down. Relax and load when its convenient for you. MI-BOX self storage containers come in three convenient sizes and can be kept on your driveway for as long as you need them. MI-BOX can also pick up the container and store it for you in our secure self storage facility. So, get the affordable new self storage experience with MI-BOX. We service Wall and Central NJ surrounding towns. Moving Companies in Wall, NJ need to be aware of the newest and most advanced moving services offered by MI-BOX of Central NJ. Gone are the old ways of moving and in is the new way of moving with mobile storage containers. Moving containers gives customers more flexible and convenient moving options at affordable prices. Moving companies need to charge more because they supply the labor and accept the liability every time they touch your belongings. With MI-BOX moving company, you do the loading and we do the driving. This can save you thousands on your next move. Take your time and load anything you need to move. Containers are rented by the month so you don't need to do everything in one day. You have the time needed to pack and load when your busy schedule permits. Have the kids help and get it done quicker. Have some friends help and get it done even faster or just simply take your time and do it when at your leisure. No matter what, MI-BOX of Central New Jersey can help. We are locally owned and operated so we value your businesses. We'll you honest, straight forward prices with no hidden fees. You'll get moving containers delivered when you want them and placed where its most convenient for you. Our patented delivery system will gently place each container on the ground so you don't have to worry about damaging your driveway. If you in need of a moving company in Wall, NJ or any of the Central NJ towns, then call MI-BOX of Central NJ Today.